A little painting I've been working on. I need a better photo.The glare from the glaze creates blotchy transitions in the color and tone.I probably should hone my photoshop skills but I'd rather be painting:). Tracey O' Shaughnessey Lecture on You Tube! We've got the video up on you tube on for those folks who couldn't attend the actual lecture. Tracey O' Shaughnessy was gracious enough to let us post it. Thank you Tracey! 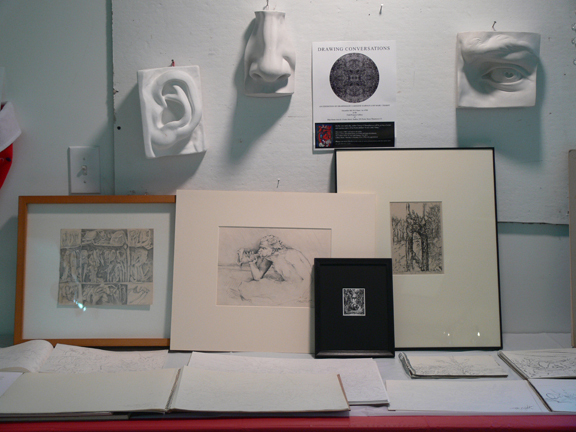 For those of you just stopping here for the first time we have an have a show of drawings up, "Drawing Conversations:An Exhibition of Drawing by Caroline Harman and Marc Chabot. Tracey O'Shaughnessey gave a great talk on about her experiences as a writer covering art for the last 15 years and why she believes newspapers perform an important function shaping our understanding and appreciation of art. The question and answer segment of the lecture was really lively and is currently in production, as is a lecture by Marc Chabot. 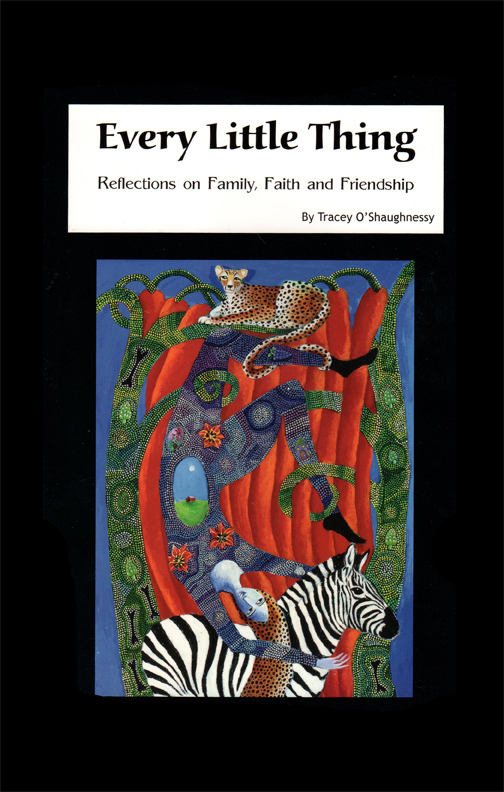 Along with the lecture, Tracey had a book signing of her collection of essays entitled "Every Little Thing." 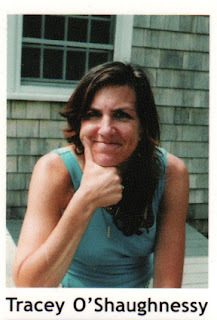 You can obtain a copy of her work at the Hickory Stick Bookshop located in Washington Depot, Connecticut.It's available elsewhere online but lets support our local and independent bookstores:)! Many! Many! Thanks! to my husband, Jay Foster for his technology Magic! 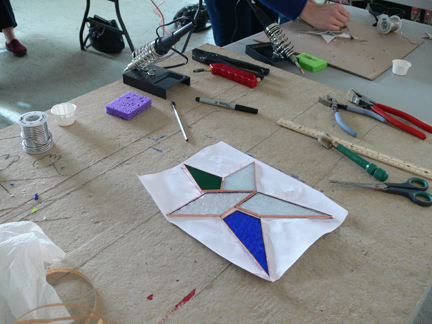 Here are some pics from Heidrun Morgan's" Intro to Stained Glass" workshop we hosted this weekend. 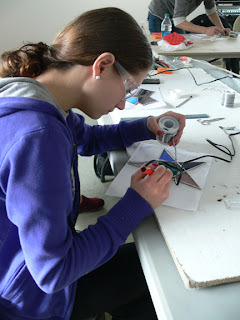 She's got another wait list going for a future workshop. Keep checking for details! Jay Foster will be holding an "Intro to Blogging Workshop" this coming weekend . He's offered the workshop for both Saturday and Sunday for those who had scheduling conflicts. There are a couple of spaces left. Please email or call if you would like more info or to register. 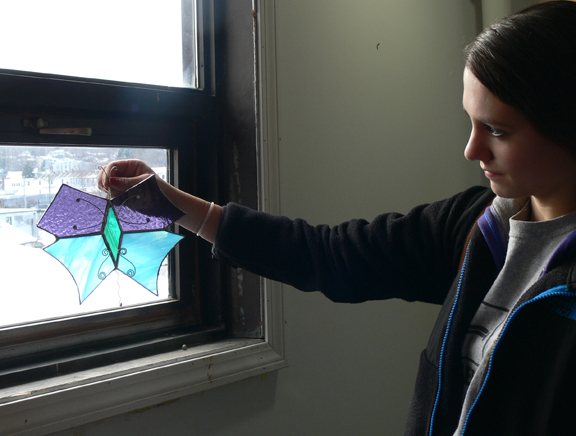 Brooke Harris showing her mom's Butterfly piece. 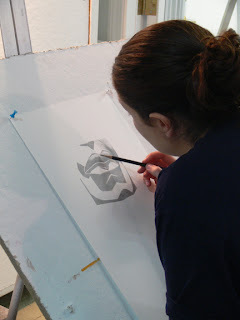 Foundation Student, Harriot Fotter working on abstract compositional studies from the observed set up during Saturday open studio. 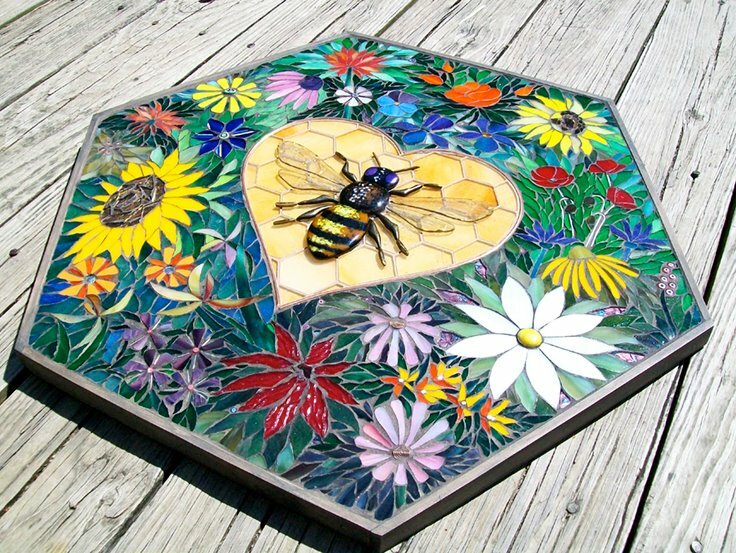 Stained Glass Workshop this Saturday! Newtown Glass Artist Heidrun Morgan will be returning this weekend to the Blue Horse Arts Studio to give her popular workshop "Introduction to Stained Glass." The course will be held on Saturday, January 19th, from 10AM- 1PM. The tuition is 65.00 which includes all materials. Currently this class has already filled but for those who couldn't make that time slot we are creating a wait list for another workshop in the near future! 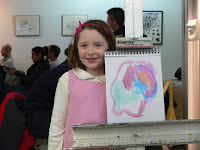 The gallery will be open for the the "Drawing Connections" show after the glass workshop at 1PM. Come on down and meet Heidrun and see what the participants created! Just what we like to see! More Musicians, More Artists, and More Innocent Bystanders!!!!! 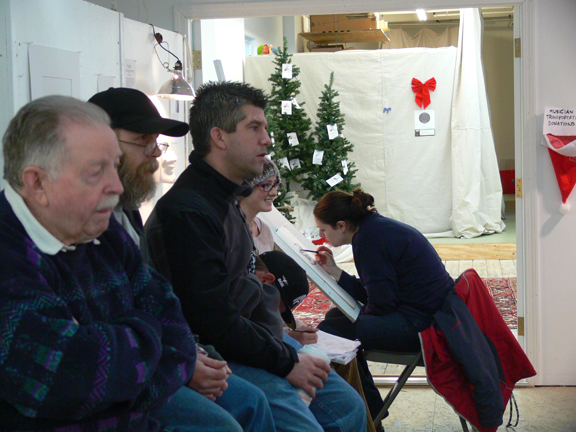 Thank you friends and new friends for coming out to Sunday's Sketch Jam! 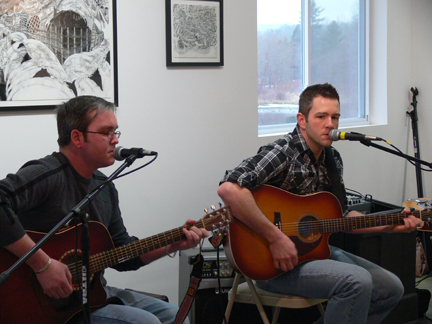 This month's event featured Bradley Costello and Brian Hobson's new acoustic act.They were great! 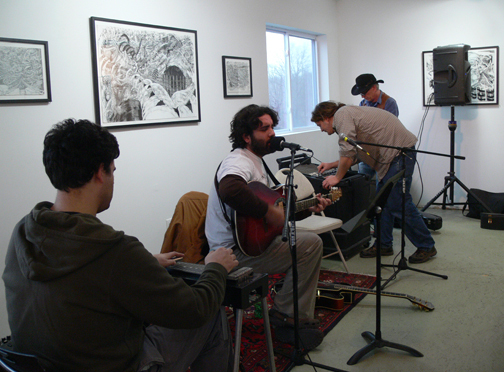 Warming up for Brad and Bri were house band musicians Keven Farrell on pedal steel, Alex Alves, and Jay Foster. Lurking in the room this week were some other esteemed musical guests. 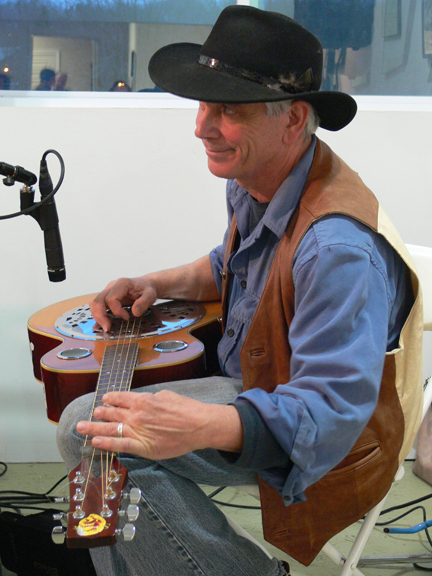 Harking back to the original incarnation of the FOBES, was bass player Bart Holcomb. 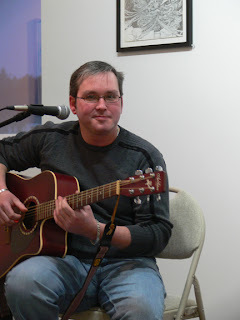 We're looking forward to hearing his new blue grass band at a future Sketch Jam!! Also in the House was the Magical Tim Mac Sweeney on his resaphonic guitar, guitarist Grant Lamphier, Drummer Dave Greene, and The Cactus! Poet and Patron of the Arts " The Groove",The Cactus, Dave Greene,Artists Jaime, Alyssa, and Sarah. 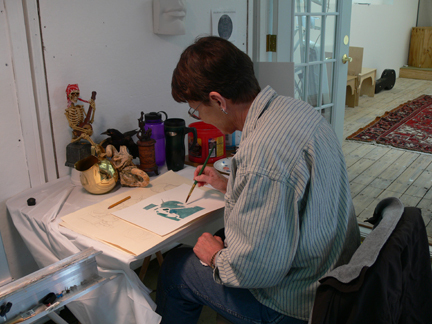 Amongst a growing number of sketchers was Claudia DuHamel sculptor, set designer, artist, and apparently chef. What else do you do!?! Claudia not only brought her sharpened pencils but some great hors d'oeuvres.Thanks Claudia! I love it when people do their homework:)! Sketch Jam Mascot and Artist in Residence Lily Lamphier and Alyssa's Awesome Sneakers! These make you draw better!!!!! 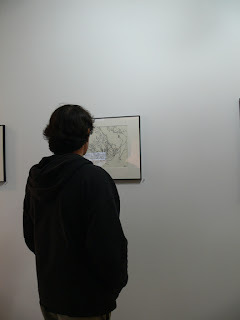 Checking out the Chabot's and the " Drawing Conversations" exhibit. 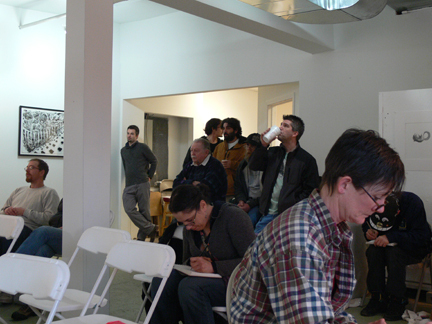 Thank you to those who came out to Marc Chabot's lecture today! It is a rare occurrence that the public gets a chance not only to hear about an artist's working process and inspiration, but for that artist to share his personal sketchbooks and early works is truly a gift. This was an informative and inspiring event for artists and those who appreciate art on a deeply personal level. When one gets a chance to spend time with Marc Chabot and his work, they are treated to a discussion with one who is truly passionate about the practice of drawing and is incredibly generous with his knowledge and experience. 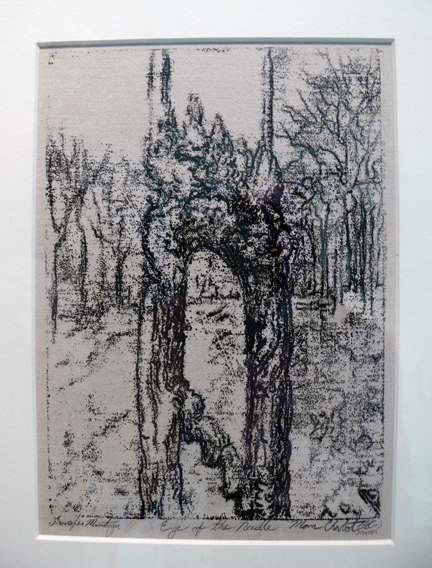 Marc shared with us with a variety of his own compelling ink drawings, monotypes, and life drawings which illustrated a range of drawing practice. Among his portfolios were works created from memory and invention, along with observational drawings from a weekly practice of life drawing. Marc states that his life drawing sessions serve to "calibrate" the eye and the hand very much like tuning a musical instrument. 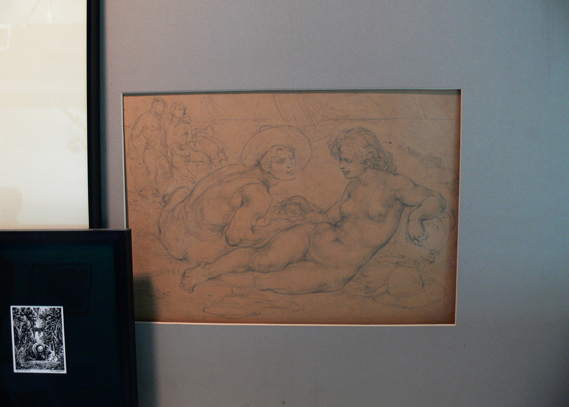 Those present today were graced with sketches and etchings from Marc's personal collection of American drawings and prints. A rare drawing by the fourteen year old Hyman Bloom, who Marc was fortunate enough to have a long personal association with, and an etching by former Woodbury, CT. resident and Surrealist, Yves Tanguy were among the treasures on display in our studio today! Included in that collection was a mind boggling miniature piece by Marc's close friend and contemporary artist, Eric Knight. 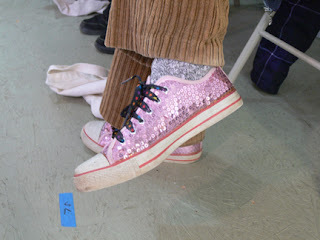 (Apologies for being unable to get a better photo please check out the link provided below)! Jay and I would like to thank Marc for taking the time to present this lecture today and hope to continue the "Conversation" on drawing in the future :)! 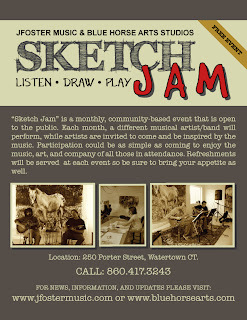 REMEMBER THAT TOMORROW IS THE SKETCH JAM!! Drawing Conversations: An Exhibition of Drawing by Caroline Harman and Marc Chabot will be on View through the end of January,2013. For more information on the artists mentioned please visit the links below. Today at 1PM Marc Chabot will be presenting a lecture on his work in the "Drawing Conversations" show that we have on exhibit. 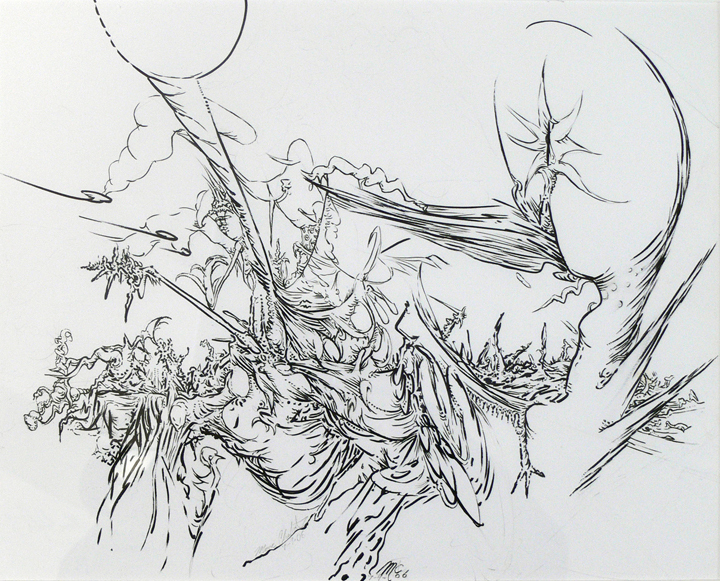 The artist will be talking about the role of drawing in his own artistic process along with a discussion the works of other artists who inspire him. Marc will also be bringing a selection of other works to the gallery for the lecture. Both these events are free and open to the public.Just come on down!!! 250 Porter Street, Watertown CT. The first week of 2013 is looking to be pretty exciting! 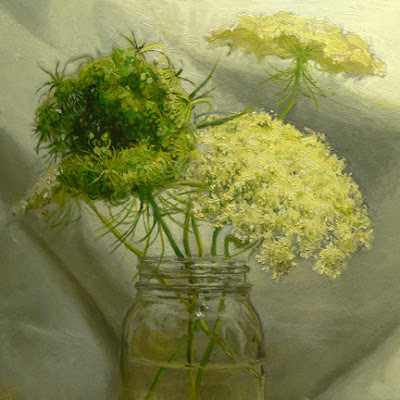 I just got notification that my painting, "Queen Anne's Lace" was selected for the Manifest Creative Research and Drawing Center's international competition, "High" (Realism's Realism). 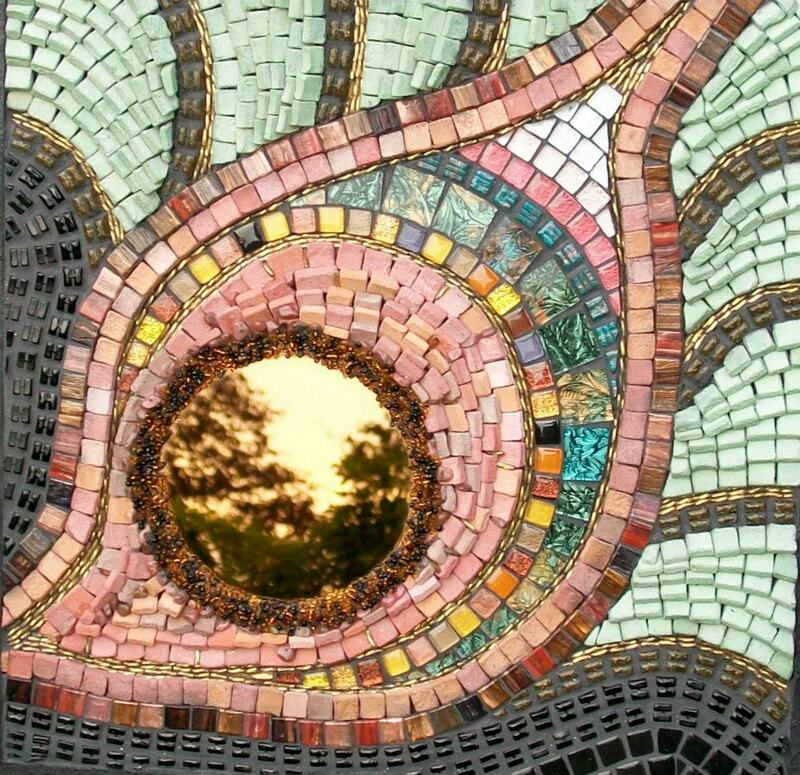 I'm honored to be one of 24 artists selected to exhibit out of 649 entries from across the U.S. and beyond. The show will be opening January 25th at the Manifest Gallery in Cincinnati, Ohio. So if you are in town, (Cincinnati that is! ), check it out! 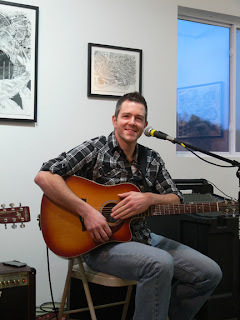 Many thanks to Jason Franz and the staff of Manifest for creating such a great contemporary art venue! 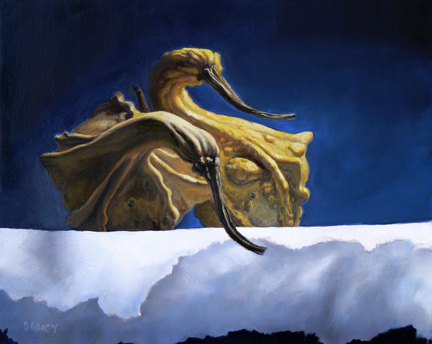 I also have an exhibition of my "Wetlands" paintings at the Atrium Gallery at the Warner Theater in Torrington, Connecticut this month. Concurrently, I have some works based on our local farms on view in Artwell's "Living Room" gallery, also in Torrington.Many thanks to Michael Yurgules and Sue Berg of Artwell Inc."for all of their hardwork!! We have lots of things going on at the studios this month and are busy finalizing plans for February and beyond. 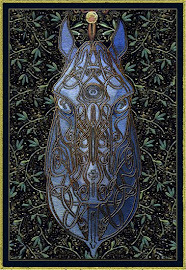 Artist Marc Chabot will be giving a lecture on Saturday, January 12th, 2013 at 1pm at the studios. 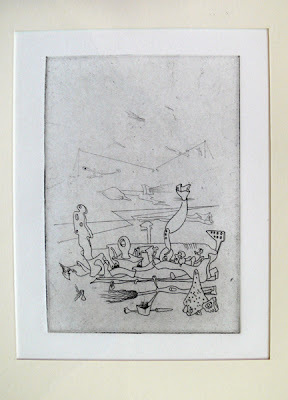 Marc Chabot is an artist and 19th & 20th century American drawing and print scholar and collector. He is also one of the exhibiting artists, along with Caroline Harman of Newtown, represented in the "Drawing Conversations," show. 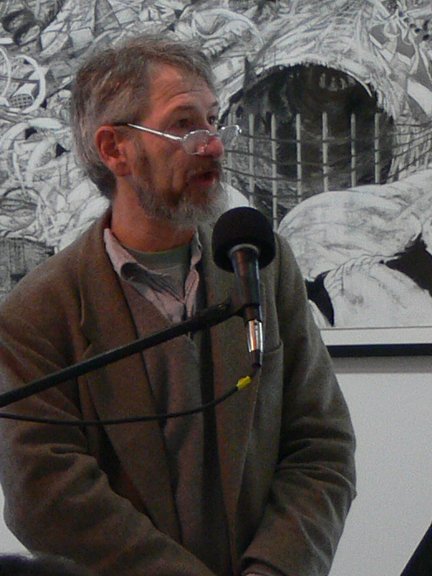 Mr. Chabot will be talking about his own process, technique and approach to drawing, the sources of his inspiration, and the place of drawing in his life. Along with the drawings he has in the show, he will bring sketchbooks and pieces not included the exhibition, as well as examples of drawings by other artists from his own personal collection, and explain how they relate to his work. "Drawing Conversations: An Exhibition of Drawing by Caroline Harman and Marc Chabot," will be on view until the end of January. 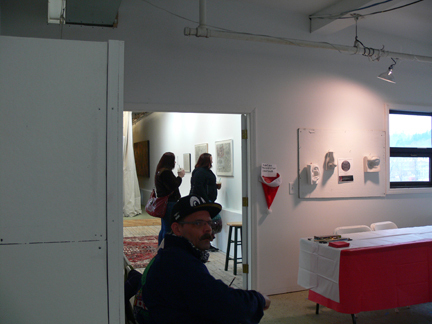 The gallery hours are Thursday through Saturday from 12PM- 5PM and by appointment. The event is free and open to the public. Light refreshments will be served. 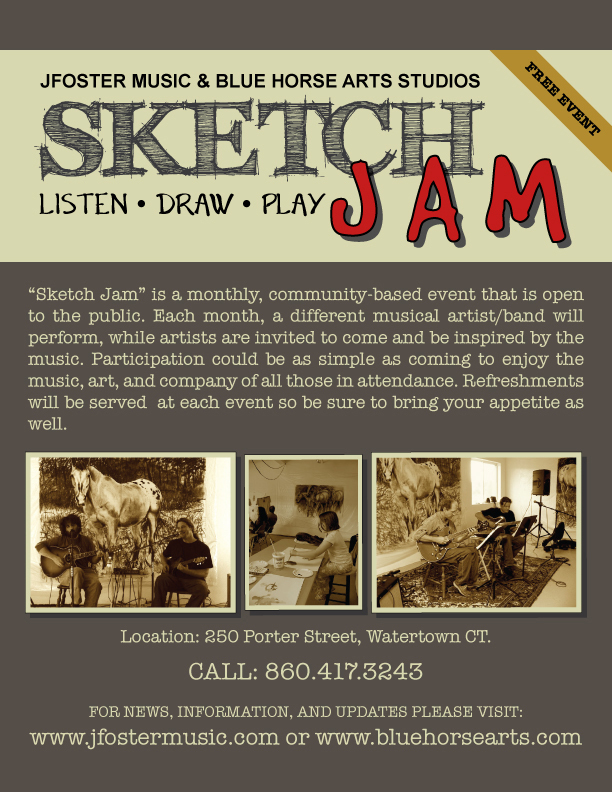 JFoster Music will be hosting another increasingly popular "Sketch Jam" on Sunday January 13th, from 3PM-5PM. The public is invited to come and listen to live music and sketch the musicians or whatever else they are inspired to create. This month's guest musician is Bradley Costello of the Jimmy Jack band(our former neighbors and snow survivalists in the building.) Bradley will be playing acoustically for this gig. This event is free, family friendly, and open to the public. As always cookies and coffee will be on hand! 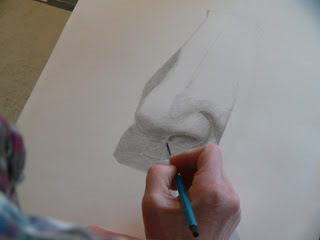 I will offering a new day time class "Drawing for Pleasure.". This 4 week class is open to adults wishing to explore a variety approaches improving one's skills and experience the stress relieving aspects of drawing. Tuition is 75.00. Some materials will be provided. 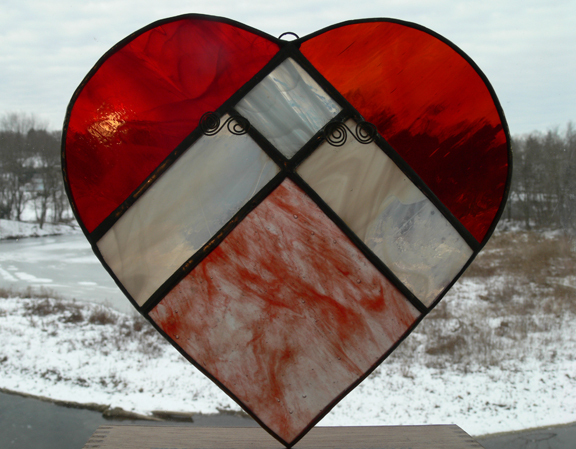 Returning by popular demand to the Blue Horse Arts Studio will be Newtown Glass Artist Heidrun Morgan. 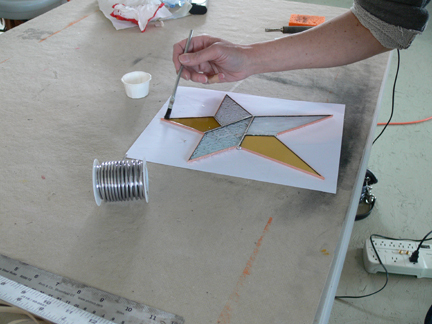 Heiu will be offering a workshop " Introduction to Stained Glass." The course will be held on Saturday, January 19th, from 10AM- 1PM. The tuition is 65.00 which includes all materials. There are just a couple of slots left! Jay Foster will be hosting a "Introduction to Blogging" workshop on Saturday, January 26th from 10AM- 12PM. Participants will learn how to set up their own blog during the class. Tuition is $65.00. Spaces are limited in this course so sign up early. Sam D' Ambruoso will be holding a Monday night painting class that will be a combination of Still Life and Portrait for more info on this please contact Sam at 203-758-9660. Blue Horse Arts and JFoster Music Studios are located at 250 Porter Street, Watertown CT. For more information please email info@bluehorsearts.com or info@jfostermusic.com, or call 860-417-3243.